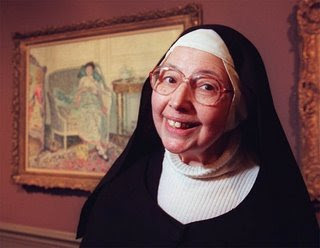 I have been watching the TV programs of Sister Wendy Beckett, who does art criticism and had a few television programs that aired on PBS in the late 1990s and 2000/2001. She is a fascinating art critic: she is confident in her opinions; she comes to interesting (to me!) conclusions; she has a gift for unfolding a painting so that you see much more in it than you ever would have thought was there. Sometimes she comes out with horrible statements like "The natural outcome of committed love is offspring," but whether or not I agree with her, I find her interpretations interesting, and I think her criticism is worth watching. It has taught me a lot about art. I have recently seen disk 1 of her Sister Wendy's American Collection program, and in this program, she goes to the Chicago Art Institute and the Cleveland Museum of Art. It so happens that I have been to these places myself, so I was doubly interested to see what she had to say about them. She is particularly fond of the Cleveland Museum of Art, which makes me happy; I will go visit it again the next time I'm in Ohio. Sister Wendy is great at communicating enthusiasm for art, and unlike most critics (but like most nuns? ), she is exceedingly modest, though she is not tentative about her conclusions. For her, the viewer senses, the struggle is to articulate her feelings/interpretations about the art in a way that will engage viewers and best represent the artist; I believe that she feels a responsibility to the artworks she discusses, and I like that sense of vocation/commitment. She can be quite funny and acerbic, which is a pleasure to see because it is unexpected, and when she is in raptures about a work of art, she speaks softly and clasps her hands together and struggles for words to express herself. She is very charming and intelligent, and her viewpoints are thoughtful. I really like watching her television programs; maybe I'll check out her books one day. From the PBS site for the American collection, here is a list of her other programs and books. This was completed circa 2001. I wonder whether she's done anything since. One painting she considers at length is Diego Velazquez's Las Meninas, which she gives a great interpretation of in Sister Wendy's Odyssey (or perhaps her Grand Tour; I can't remember) when she goes to Madrid; she calls it, in fact, the greatest painting in the world. It certainly is really fascinating, and I love how, as she points out, the focal point (ostensibly) of the scene that is occupying the figures in the painting is not in the painting itself. Velasquez (the painter) is painting, probably, the portrait of the Spanish king and queen. He is looking at them, and so is his daughter (the silvery little girl with the people all around her), but we see them only in reflection in the mirror at the back of the painting. We, like the king and queen, survey the scene before us—and for a moment, you think that the painting has placed you in that position of royalty and has made you the central point of the artist's and the daugther's attention. However, as Sister Wendy (and others) point out, the true focus of the painting is not the absent king and queen, or even the pretty little girl: it is the painter, whose own canvas slashes across the left-hand corner of the painting itself—and who has replicated several other paintings done by other artists and painted them on the wall in his own painting. He has thus shown us he can do what the other painters can do, and better; furthermore, he stands proudly in the painting and meets us with a direct gaze. He has orchestrated all of the scenes we are considering: the one we are looking at of him and the princess and her maids; the one we are imagining ourselves part of (ourselves standing next to the king and queen); the ones in the images he has replicated on the walls. In cutting the picture with his canvas (the one on the left, the one he's working on), he reminds us of the act of painting, the work that goes into it, and the fact that it is staged, arranged, created—by HIM. It is really a great painting because it places the viewer in a unique place, engages him or her, makes him or her a part of the scene in the picture—and then calls our attention back to the great artist who has arranged it all for us. I started reading this on my trusty Treo using eReader. About halfway through I bought an iPod Touch and finished it on there (still using eReader). McDermid is so good that things that would normally annoy me don't. For example, I don't often find myself liking mysteries that take place over a large amount of time, jumping back and forth from past to present. I'm not sure what it is about this technique that bothers me, I just know that it serves as a red flag warning me that I'm likely to be disappointed. The woman who answered the door had the air of someone who had spent her days lying down so life could more easily trample over her. "It felt like a slap in the face. Nothing glamourous about helping the miners, was there?" A bitter little smile lit up her face. "Could have been worse, though. We could have had to put up with that sanctimonious shite Sting. Not to mention his bloody lute." People sometimes remark that I must work hard to produce a book a year. They look offended when I laugh. Then I explain. And they get it. Both my grandfathers were miners. The one who only had daughters rejoiced that no child of his was going to have to spend a working life underground. Deep underground in the heat and the stink and the filth and the danger, they knew what hard work was, my grandfathers. I spent a lot of my childhood in East Wemyss, staying with my grandparents. My grandfather once took me underground in the cage, strictly against the rules. I was about six years old, a lover of fairground rides and scary helter skelters. Nothing had prepared me for the way the cage dropped through the darkness, so fast I felt weightless, my stomach left behind somewhere above me. The faces around me, weirdly lit by the lamps on their helmets, were unmoved. They were used to so terrifying a start to their shift. They were destined for eight hours of hell, relieved only by the companionship of the other men on their gang. Me, I went straight back to the surface. My grandfather took me to the canteen for steamed pudding and custard. Another memory from childhood: a close family friend, Uncle Doddy, was caught in the blast when a fuse burned too fast and a shot fired too soon. His face was wrecked, healing into a mask of scar tissue and blue-black coal tattoos. He lost most of his eyesight, spent months in a hospital bed. Everybody was reluctant to let me visit. They thought I'd be too scared. But it turned out I was too young to be scared. I knew his voice, I knew him. I had no reason to be scared. Other kids, kids who hadn't known him before—they were scared. They were terrified of the man with the melted face. I didn't realise it then, but those tiny windows into life at the coal face tempered my whole experience of life in a mining village. It saved me from sentimentalising the community spirit that ran through East Wemyss like the veins in blue cheese. It was real enough, that sense of mutual support, that 'kick one and we all limp' mentality. People did take care of each other. It was bred in the bone, a legacy of the grim battles the miners had fought through history to earn respect and a decent living wage. My grandfather remembered when miners were treated as if they were as much the property of the mine owners as the coal itself. He remembered the strike of 1926 when he was barely thirty years old with three children and a wife to support, when they stood in line at the soup kitchen, when he walked twenty miles for a hand-out of new boots for his gang. If you didn't stand together at times like that, you all went under. The miners united will never be defeated. They played together as well as working together. I remember mass picnics, miners' galas, football matches on terrible pitches, pit bands playing in Sunday parks. I remember visiting my grandfather in the miners' convalescent home when he was recovering from his first episode of heart disease. He'd had rheumatic fever as a boy, which had kept him out of the WWI trenches but not the mines. Years underground compounded the damage. When I was growing up, he'd walked us kids for miles along the beaches and through the woods, teaching us the names of shells and trees. The last few years, he could barely make it to the end of the street. At least by the time he was sixty, they finally had running hot water. And a bath. Our village got a preview of the devastation that would hit mining communities after they lost the 1984 strike. In 1967 a devastating underground explosion and fire killed nine men. The Michael had been a vast, showcase mine, with seams running under the sea for miles. But there's no way to extinguish a fire like that short of sealing up the shafts. So in 1967 the Michael died and East Wemyss went into terminal decline. The miners left to find work in other pits, taking their families with them. Only the pensioners were left. As they died off and houses were left empty, so the shops, churches and pubs closed. Then a few years ago, when Edinburgh house prices went through the roof, commuters discovered the Wemyss villages and colonised them. The pit buildings were flattened, the slag heaps trucked away and the Fife Coastal Path was inaugurated. If you want to know the history of East Wemyss, don't bother asking anyone who lives there. Google it instead. I'm glad my grandfather was dead before Thatcher and her vindictive crew chose the miners to be the sacrificial victims of their policy to emasculate the trade union movement. If he'd been alive, it would surely have killed him to see what happened to his village replicated all over Britain's coalfields. The 1984 miners' strike is part of the history syllabus now. It feels far too recent for history to have weighed those events in the balance. But at least these days, it's not only the victors who have the chance to write the record. A DARKER DOMAIN touches on some of that history. I'm proud that it's also part of my own past. His upcoming visit to Lincoln is now listed on his website (under "June 2009 US book tour"). I should mention that this tour is in support of the paperback edition of Dress Your Family in Corduroy and Denim (I think. No, I'm pretty sure.). When You Are Engulfed in Flames (d'oh). I'm in the middle of season 4 of The Wire on DVD (thanks, Beth! ), I just watched an episode of the Bill Moyers Journal featuring David Simon, and my new boss grew up in Baltimore. And, of course, I just finished reading Life Sentences. I'm starting to feel a little stalker-y. I just joined bookarmy. From what I can tell, what sets bookarmy apart from the other book sites (GoodReads, Librarything, etc.) is that it is set up specifically as a social networking site for books. Before they can lure me away from GoodReads, though, they need to get those apps/widgets created so I can flow my current reading list to this blog. Bookarmy is a social networking website for every sort of reader. Whether you’re a bookaholic or someone who picks up a book only once a year while relaxing on holiday, bookarmy is the place to discuss and review books, build reading lists, get the best book recommendations, and where you and your friends, family or classmates can read books together. What makes bookarmy different from other book sites is that here you can make direct contact with authors; see what star rating they have given books, browse their reading lists, ask them questions about their own writing, and recommend titles to them. Why did we create bookarmy? Quite simply because we love books and we wanted to design an easy and reliable way for people to talk to other readers and decide what to read next. For more information, you can also check out their blog. If you recall, readers of Tomato Nation raised over $100,000.00 for Donors Choose last fall. As a result, Sars had to go to D.C. in her tomato suit. I finally finished Lonely Werewolf Girl by Martin Millar (published by Soft Skull Press). If you buy a copy from here, the author will sign it. Apparently, he's working on a sequel. How can you not like a book whose main character is a depressed young werewolf whose only comfort comes from laudanum and The Runaways? Is it just me or do plot synopses of sci fi/fantasy books always sound silly? Teenage werewolf Kalix MacRinnalch is being pursued through the streets of London by murderous hunters, while her sister, the Werewolf Enchantress, is busy designing clothes for the Fire Queen (who is unstoppable in battle yet can be reduced to floods of tears if someone wears the same designer outfit at a party). Meanwhile, in the Scottish Highlands the MacRinnalch Clan is beset with internecine conflict after the Thane of their clan dies intestate. Scandalously, the Thane's death was the result of a mortal injury inflicted by his emotionally unstable teenage daughter, the afore-mentioned Kalix, who it turns out is on the lamm. As the court intrigue threatens to flare into civil war, the competing factions find that Kalix is the swing vote necessary to assume leadership of the clan. Thing of it is, quite apart from her fear of reprisals, she was never much into clan politics, especially after her father banned her from seeing her boyfriend Gawain. But she is rather into laudanum. Lonely Werewolf Girl is an expansive tale of werewolves in the modern world—elegant werewolves, troubled teenage werewolves, friendly werewolves, homicidal werewolves, fashion designers, warriors, punks, cross-dressers, musicians—an entire Clan of Werewolves, getting in trouble from the Scottish Highlands to London, and in several dimensions beyond . . . I [don't] understand why Martin Millar isn't as celebrated as Kurt Vonnegut, as rich as Terry Pratchett, as famous as Douglas Adams . . . I've been a fan of his work for almost twenty years. The Girl in the Green Raincoat was serialized in The New York Times starting on September 5, 2008 (read chapter 1 here).
. . . And I just want to say—it was a blast. I liked everything about the experience—the challenge of writing to length and creating pieces that were semi-discrete; the face-saving corrections on salient details about my hometown (the Edmondson Drive-In! the Edmondson Drive-In!). A big thank-you to Ilena Silverman, Aaron Retica, Bill Ferguson and everyone at the Times Magazine who shepherded this girl and her “Girl” through the process. You can read “The Girl in the Green Raincoat” online. I’m not sure when it will be published as a book. I do know that I won’t expand it; it’s the length it should be. I’m also not sure what it augurs for Tess. When I wrote the proposal, I believed it would be the definitive end to the Tess Monaghan series, but I no longer feel that way. I just don’t know how or when she will return. I, for one, am glad to hear that we can expect more in the Tess Monaghan series. I'm also looking forward to Life Sentences, Lippman's new stand-alone novel. Unfortunately, though, it appears that Lippman won't be returning to Nebraska on her book tour. Too bad. I really enjoyed her reading last time. I just tried to read two books: Erin McCarthy's Bled Dry and Kate Carlisle's Homicide in Hardcover. These works are in genres I don't usually read—romance and mystery cozies, respectively—but I liked the sound of each and figured I might enjoy the books. That I didn't could say more about my dislike of these genres than anything else, but for what it's worth, here are my thoughts on each. 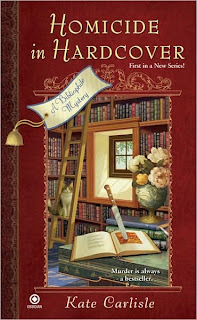 Homicide in Hardcover, by Kate Carlisle, identifies itself as "A Bibliophile Mystery" on the cover; this is the first book in the series. 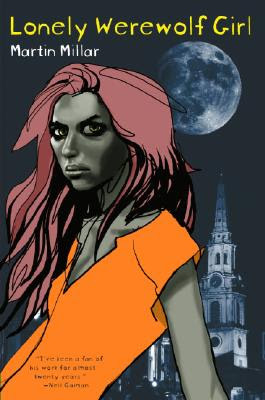 The main character, Brooklyn Wainwright, lives in SF and works as a book restorer. She grew up on a commune with her hippie-ish (but rich, we are told, still very rich) parents. She has a trust fund. So do her other friends. They are rich, rich, rich. She went to Harvard. She now has her own business. There is a hot British cop in the book. I wanted to love this, I really did, because I almost always enjoy mystery novels about book lovers, but I found the voice of the main character in this one a bit too wooden. I'd missed him, loved him like a favorite uncle. This was the first time I'd seen him since severing our business relationship, but he was acting as if we'd never been apart. It was a little weird, but I was happy (12). I don't even know what to say about the fact that the hero's name is Derek Stone, or that Brooklyn Wainwright (if she marries him, she can be Brooklyn Stone) nearly faints in his arms on their second or third meeting. Anyway, my point is that a book restorer—someone who spends hours working meticulously on books; someone who is well versed in arcane history and knowledge; someone who thinks carefully about details; someone who probably reads a lot about, well, many topics—should be more articulate and thoughtful than this narrator is. I don't care if she's not aware of her own feelings. I don't even care if she's simply being flip. I simply believe she should be able to express herself more eloquently than she does in this book, and that made her unconvincing (and really pretty annoying) to me as a character, and so I couldn't finish the novel. 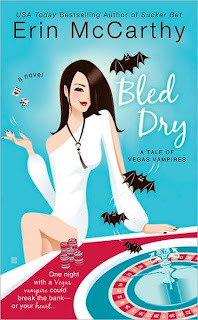 The second book I chose, Bled Dry, by Erin McCarthy, is one of an ongoing series about a group known as the Vegas Vampires. In this one, a young woman named Brittany Baldizzi discovers that her one-night stand with the dashing French vampire Corbin Jean Atelier has made her pregnant. Wow. You know, I really have nothing else to say here. What on god's earth was I thinking even trying to read this? I hate pregnancy stories. I don't even like Las Vegas. In conclusion, I'd like to warn you all against haphazardly purchasing books. On any given night in the bookstore, you might delude yourself into thinking, Sure, I've never liked this kind of book before, but hey, I just might this time! What I have found is that you will not. You are stupid and will soon be very annoyed with yourself for not having gone to the library instead. But THEN, you would think, How can I even go to the library in a town where the libraries all close at 8:00 p.m.? How is that an at all reasonable time for a library to close? I cannot go to the library, you would finally have to realize. Then, perhaps, you'd think, I know! I'll try to go on Saturday! At 7:00! So you would attempt that, too, and know what? The library closes at 6:00 p.m. on Saturdays, so you would fail then as well. It makes me sad and angry that this town has failed to fund its libraries adequately—and now, they are even thinking of closing one. Hm. The hours are actually a bit better than i thought. Still, the libraries need more money, and no one should purchase books haphazardly and foolishly. I will not back down on these controversial and important points. First, I made her look me in the eye and swear she was telling the truth. I now believe her. She said that she scored this event partially because of a previous, very successful Harry Potter event. Sedaris often likes to spend a couple of hours at the store before the event, so get there early! So far, I can't get her to promise a front-row seat for me. Come on, Steph—don't make me beg. But! Maybe I can hand books to him while he's signing (I've already started practicing). Been keeping up with The Books of the States? Get caught up with The Roll Call at Omnivoracious. I have always been a fan of the gross and horrific. My brother and I grew up watching horror movies. When we were little—this would have been in the 1970s—we watched a ton of old black and white horror movies. 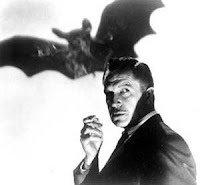 I can remember a specific conversation we had about how you know it's going to be a great movie if Vincent Price is in it. Fast forward a few years: One Friday night when I was around 12 or 13 (and my sister was about 5 or 6) I noticed that The Shining was on cable that night. I had seen it already and wanted to watch it again but was too scared to watch it by myself. And my brother had other plans. I'm not proud of what happened next—I made my poor little 6-year-old baby sister watch The Shining with me. I'm not sure she's ever completely forgiven me for that. But! She still loves horror movies. Of course I also liked to read horror and as I got older it was primarily Stephen King. In my younger days, though, I was crazy about the Three Investigators series by Robert Arthur. Oh how I dreamed of having a PI agency in a trailor in a junkyard! And a skull named Socrates (swoon)! You may be wondering how I've kept my youthful Pollyanna-ish disposition after all of this horror. The answer is that I've always had "palate cleansers," or what I often think of as "nice books." My first palate cleansers were the Little House Books and three titles by Frances Hodgson Burnett (he edition I had was all three bound together in one volume: The Secret Garden, A Little Princess, and Little Lord Fauntleroy). I throw one or more of these in the mix in between reading things like Stiff, The Speckled Monster (includes photos! ), Body Farm books, etc.